The lawsuit points to the shooting in Sutherland Springs, Texas, as an example of failure to report a person who's barred from buying guns. American cities are suing the Pentagon over its failure to report military convictions that would bar a person from buying a gun. New York, Philadelphia and San Francisco are named as plaintiffs in Friday's complaint filed in Virginia. 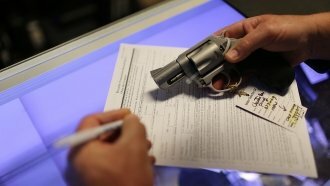 Those cities want a court order to require federal monitoring of how the Defense Department reports convictions that would bar a person from legally buying a gun in stores. Military officials acknowledged those rules haven't been enforced in years. Recent studies have shown the military fails to report crimes that should appear in background checks roughly one-third of the time. The lawsuit explicitly points to the deadly shooting in Sutherland Springs, Texas — the shooter was able to buy a gun despite being court-martialed and sentenced to a year in jail for domestic abuse. The suit argues the shooting might have been averted if the military had properly reported the shooter's criminal record. The lawsuit says it's not asking for any new law, just for the court to compel military leaders to "diligently implement, and consistently apply, the unambiguous laws that have been on the books for decades."